Author: Melvice Asohsi. Series edited by: Wilhelm J.G. Möhlig, Bernd Heine. 16 pp. Roman, 276 pp. 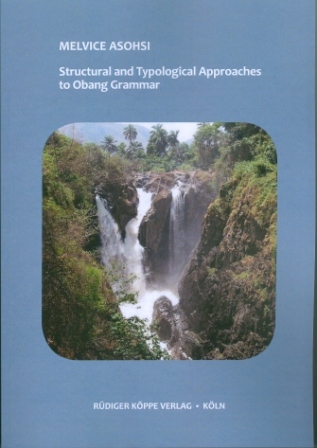 This book describes the grammar of Obang, a Niger-Congo lan­guage that belongs to a geographically defined group of lan­guages in the Northwest Region of Cameroon known as 'Grass­fields Bantu languages'. Within this group, particularly the dia­lects of the Befang-Menchum sub-group are linguistically understudied, and so is Obang. Moreover, the language Obang is still unwritten. The present study, which is the first detailed one of its kind, therefore does not only attempt at providing a comprehensive description of the phonology, morphology and syntax of Obang based on empirical data, but also intends to fit the language in the general picture of Grassfields Bantu with its inherent unique features and in the expansion of Bantu as a whole. Applying Dixon's 'Basic Linguistic Theory' (1997) which has the advantage of describing each lan­guage in its own terms rather than forcing it into the framework of other languages, the study is purely descriptive. The collected Obang data demonstrate interesting phenomena, for instance the lengthening of a final vowel as question sign (an aspect of prosody) as well as morphosyntactic phenomena such as stacking of verbal suffixes etc., which have not yet been reported especially for languages of the Grassfields region. Nonetheless, the unique puzzles of the Obang language provided here are typologically and theoretically significant. Therefore, the present work is also placed within the broad comparative concerns of linguistic typology by adopting both a structural and a functional approach. Structurally, the first parts of the book present the basic units of the language and look at possible variants where necessary and at their combinatorial properties. The later parts then examine the functions of the structural components of the language in higher constructions and emphasize the interplay of communica­tive needs with the fundamental aspects of the language. Melvice Asohsi provides with her Grammar of the Obang language an important contribution to the research of Bantu languages. Obang belongs to the Menchum subgroup of the Wide Grassfields languages, a group that, different from the Narrow Grassfields languages, has not received much scientific attention in the past: only the nominal syntax of Modele has been researched so far [...] Nevertheless, this work is an important contribution to the study of the Grassfields languages, being the first thorough analysis of a Menchum language. It reveals typologically exceptional phenomena such as vowel lengthening of the last syllable in the sentence to accomodate a falling intonation in polar question sentences. The data on Obang verbal extensions and their mobility is very interesting and can be used for comparisons with other Grassfields or Bantu languages. Furthermore, the Obang grammar is of great interest to scholars working on the reconstruction of Bantu languages and in particular the Grassfields branch.